ANNE-VILLE: You're My Boy, Blue! 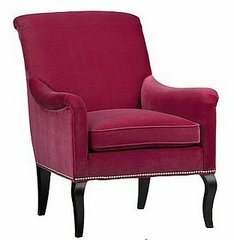 When Mom and I went to the consignment-store-mecca a couple weeks ago (where i got the frame turned earring screen), I non chalantly mentioned I was looking for a living room chair. No sooner had I said that, I turned the corner and stumbled upon a beautiful blue bundle of goodness. I sat down in it, I petted it, I cooed all over it, I hugged it. It sure was pretty and pretty darn close to what I was looking for and I couldn't beat the price either. Now that the curtains are up across the room, Me thinks this chair needs some accessorizing, perhaps a throw pillow? I mean, look at the colors, how much better matched could I get? Hm... another project on the todo list.